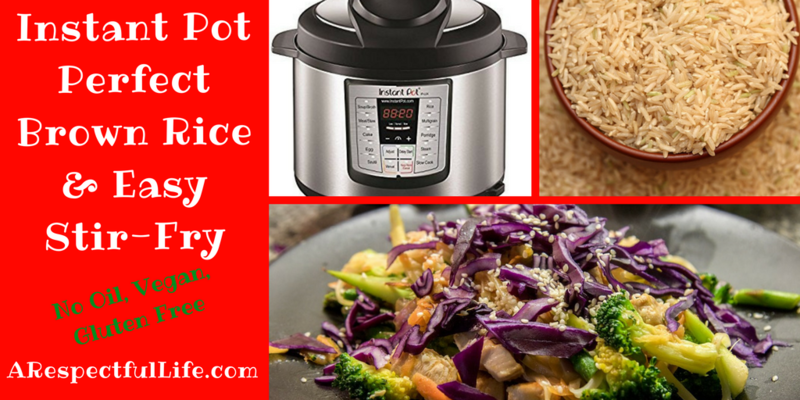 Perfect Instant Pot Brown Rice and an easy Asian style stir fry with what ever vegetables you wish to use! Add rice and water to the Instant Pot. Close and lock the lid of the Instant Pot. Use Pressure Cook function and set to 22 minutes of pressure cooking time. In large sautee pan, add 4 cups vegetables, tofu/tempeh/beans, and all ingredients except for the arrow root. Simmer over medium heat until veggies are cooked. In small bowl, whisk 2 tsp of arrow root and 2 TBSP water together. Add to dish to thicken sauce.